Sargassum/Sargasso in Belize: It's What's All Over the Beach! Home » Belize Travel Blog » Around AC » What Is All Over our Beaches? What Is All Over our Beaches? It’s a strange and relatively unexplained phemonenon that has been plaguing much of the Eastern Carribbean since late last year. And it comes from an area near the Bermuda triangle. Intriguing, right? 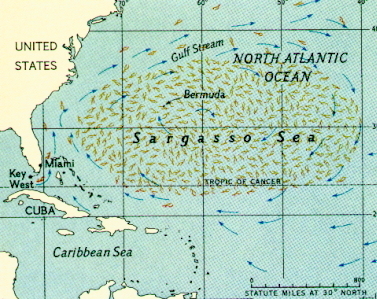 The Sargasso Sea is an area in the middle of the North Atlantic Ocean surrounded by ocean currents. The gulf stream and various currents are its “shores” and it is a swirling mass of sea weed and all of the trash (called the “Great North American Garbage Patch”) that the currents carry. It’s also home to the seaweed called sargasso (single: sargassum) that rises to the surface in huge quantities…it has been called a floating city. It’s not just a bad thing…baby sea turtles use this area and the seaweed cover for protection so they can grow big and strong. So…what does this have to do with Belize? Starting last summer and fall islands like Anguilla and St. Marteen and as far south as Tobago have been reporting sargasso seaweed washing up on their shores in amounts never seen before. There is a very interesting NY Times Article about the build up in that Caribbean area and how an upscale resort closed for a month or two when the seaweed was washing up by the ton. (Check out some pictures in Antigua from a local blogger: WOW Sargasso. She also talks about how the giant rafts of weed are bringing in smaller, not normal native animals). Belize is not nearly so bad but it is worse than it has been in recent history. Let’s call this picture: Sargasso Sunrise in San Pedro. Why is it moving all across the Caribbean as far south as Belize? No one really seems to know…the oil spill of last year or climate change or maybe just a slight change in currents? But beach staff in San Pedro are working a daily battle to clean up this stuff. So far, most hotels and resorts are able to keep their beaches relatively clean…let’s hope it doesn’t get any worse. The key seems to be getting the seaweed out of the water and letting it dry out so that it doesn’t start to decompose and smell…funky. Rinsed with fresh water, it makes an excellent mulch. Keep up the good work guys! I know it’s not easy. It was terrible all winter in Maya Beach/Placencia area too (our house is in Maya Beach). I noticed it was a different kind of seaweed than just the usual seagrass. Most beach front owners leave the seasonal sea grass on their beach to help prevent erosion and build the beach, but this sargasso stuff is TOO much! Where is it not cleaned up…it stinks! It seems to be getting a bit better this week…but not so much. I have visited San Pedro many times and have always wondered what happens to all of the seagrass that is collected each morning. Is it burned, buried or ?? ?